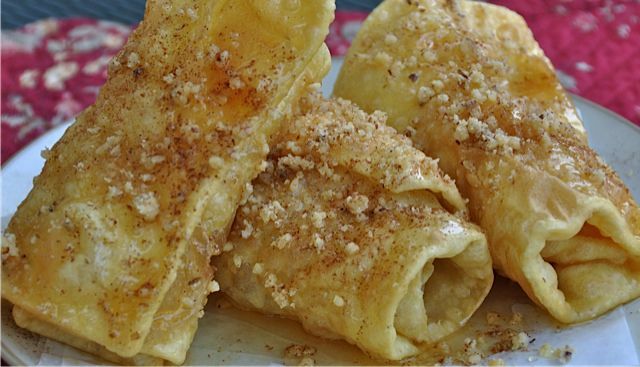 They are thin sheets of dough that are folded while being fried into a crispy package that is drizzled with honey and dusted with cinnamon and ground walnuts. This recipe has been adapted from the cookbook of the Ladies Philoptochos Society of Saint Sophia Greek Orthodox Church in Elgin, Illinois. Sift the flour with the baking powder into a bowl and set aside. Using a hand mixer or stand mixer, beat the egg yolks and whole egg on high speed until the eggs are thick and smooth and the color is light yellow, about 4 -5 minutes. Combine the melted butter, orange juice, and brandy. With the mixer running, add to the egg mixture until incorporated. Add the flour in 1/2 cup increments until the dough comes together and doesn’t stick to the sides of the bowl. If you have a dough hook for your mixer, you can attach it and knead the dough with the machine. If not, turn the dough out on to a lightly floured surface and knead by hand. Continue kneading the dough until it has a smooth and elastic texture, about 5 – 8 minutes. Separate the dough into four pieces, and rest it on the counter covered with plastic wrap for about half an hour. After the dough has rested, roll out each section into rectangles about the size of a sheet pan. The dough should be very thin about 1/16th of an inch thick or about the thickness of a piece of cardboard. Using a knife or rolling cutter, cut the dough into sheets that are about 5 inches wide and about 10 inches long. Lay the cut pieces on a tray separated by wax paper sheets to prevent them from sticking together. To fry, you will need a pan with a wide bottom and a depth of about 4 – 5 inches. The oil will need to be poured to about 3 inches in depth. Heat the oil or vegetable shortening until shimmering but not smoking hot. If the oil is too hot your diples will get too dark and will cook too quickly, making it difficult to roll them. Place a dough sheet in the hot oil. Using two large cooking forks, hold the end furthest away from you and roll the sheet away from you. You can pierce the sheet with the fork or simply place the edge between the tines of the fork. Hold the roll in the oil until both sides are a light golden color. These cook quickly so be sure to have your ingredients and tools in place. It’s best to cut all the dough sheets before you begin frying. Drain and remove the rolls to a tray layered with paper towels and stand them on their ends to prevent them from becoming mushy. To make the syrup, combine the honey and the water and heat gently on the stovetop or in the microwave. Place the diples on a serving platter and drizzle with the syrup. Sprinkle with ground walnuts and ground cinnamon. To keep the diples crisp, do not add the syrup until just before you are ready to serve.